If you are renovating your home, you should consider custom wrought iron doors Houston. Your door makes a statement about your home. It is important that you pick a door that suits your style. It also needs to work well with your home’s décor. Wrought iron looks great on almost any style of home. It can even add a rustic touch to modern styles. There are many other benefits to installing these types of doors. Wrought iron exterior doors are known for their durability. Gates and other entryway touches give your home curb appeal and can raise its value. This style of door does not need to stay outside either. There are many ways you can incorporate wrought iron in your interior design as well. If you are looking for custom doors, visit Southern Front. Their custom wrought iron door prices are affordable. Southern Front prides itself on providing well-made doors to consumers across the country. Visit them online to take a look at their materials. You can find them at http://www.southernfront.com. Prospective customers can also contact them by calling 281-890-5860. Once you learn the benefits of using wrought iron in your renovation, call Southern Front today. One of the biggest benefits of buying wrought iron exterior doors is their durability. Your front door needs to look beautiful and withstand a lot of damage. Entryways see a lot of wear and tear, more than any other area of your home. Doors need to withstand elemental and temperature variations. They also need to be resilient and resistant to scratches and dents. Many homeowners also prefer doors that are easy to clean and maintain. Wrought iron is an ideal choice for your front door. It is a beautiful metal and is easily customizable. You can combine wrought iron with almost any other material, or opt for iron alone. These types of doors are very durable, and will last a long time. Ordering your custom door from a retailer that offers a warranty can give you peace of mind. Iron is also very easy to clean. Most people use nothing more than soap and a soft cloth. 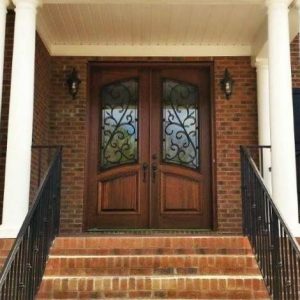 If you are looking for a custom iron front door, visit Southern Front. They have a wide selection of preexisting models you can view at http://www.southernfront.com. You can also contact them by calling 281-890-5860. Consumers interested in custom options can contact them by phone or email to learn more. Southern Front is happy to ship to homes across the U.S. and Canada. Homes with long walkways often enjoy a gate-style door at the end of the path. These doors are charming ways to add a rustic touch to your home. They also add a lot of curb appeal. Wrought iron can spruce up any home’s exterior without much effort. By increasing your curb appeal, you can increase your home’s value. Even if you are not planning on selling soon, this is a good reason to consider wrought iron. When you are searching for a wrought iron gate in Houston, be sure to look for quality over price. Disreputable retailers often use subpar materials in their cheap products. As a result, your gate will not look as nice for as long. It may rust prematurely or oxidize despite your preventative measures. Finding a respectable retailer is not that difficult. Look for one with many years of experience supplying wrought iron and other custom materials. Customers searching for wrought iron gates can visit Southern Front. They have experience selling custom and premade doors and glass to consumers across the country. You can visit them online at http://www.southernfront.com. You can also contact them by calling 281-890-5860. They want to be sure that you love your home. Adding an exterior gate can sometimes be the best way to do so. Contact them to discuss custom options for your home today. One of the biggest myths about custom doors is that they are very expensive. The good news is that custom wrought iron door prices can be affordable. If cost is a concern, take your time when searching for a retailer. The right supplier will have high quality doors at prices you can afford. Be sure you focus on quality more than cost. A durable door will last longer than a cheap one. This means you will save money down the road. Well-made doors also insulate much better, often translating to reduced energy costs. Other homeowners may be worried that wrought iron is too expensive to care for. This fear can prevent them from investigating the idea any further. In reality, wrought iron is very easy to keep clean and care for. It is easier to maintain iron than certain types of wood. Speak with a sales representative about any fears you have. They will be able to dispel any myths about wrought iron or custom doors. Consumers interested in learning more about custom wrought iron can call Southern Front. Their contact information is online at http://www.southernfront.com. You can also reach them by calling 281-890-5860. They would be happy to answer your questions about custom wrought iron. Southern Front wants to be sure you have the door of your dreams. If you are thinking about wrought iron, speak with them to learn more. You may find that it is the perfect option for your home. There are many reasons why you should upgrade to custom wrought iron exterior doors. These doors are made specifically for your home. This means that they are cut to fit your exact door frame. A door that fits perfectly will block out the elements and noise. It will also insulate your home much better than a standard-fit door. Custom doors also look nicer. You can pick a style that suits your home perfectly. If you are thinking about custom doors, contact Southern Front to learn more. You can contact them by calling 281-890-5860. They have many years of experience providing homes across the country with beautiful custom doors. You can also visit them online at http://www.southernfront.com. Southern Front wants you to have the door of your dreams. Speak with them about the best way to install beautiful custom wrought iron doors Houston today.